This weekend I got to see my city from a different perspective. This is not a metaphor (but be sure it will soon turn into one!) but a literal statement. I went to explore Williamstown for the first time. Sure, I have been there once before, but we only walked along the main street before getting the train back. This time we explored. We walked along the sea front, greeted a number of happy dogs out for a walk, and took in the scenery. This is a view of Melbourne I have never seen before and it got me thinking. It seems that recently, I have had a lot of clients come to me with anxiety about the ‘what ifs’. And more specifically, the ‘what if’ I get anxious. Anxiety is insidious, it breaks you down, it lies in wait until the perfect moment and then it grabs you. It is your most familiar companion, and yet your most unpredictable. And so it is no wonder that people begin to fear panic attacks. I was worried about situations in which I might panic and make a fool of myself. This worry about worry is always fruitless and leads to a cycle of avoidance, greater fear and increased anxiety. And it manifests its own self; it makes itself true. I was really anxious, so I didn’t go. But then I went later but the whole time I felt like I needed to leave. And I managed to stick it out but I was freaking out the whole time. And when I left I collapsed into bed so exhausted. I really didn’t cope. I was worried that I would have a panic attack, so I stayed home for a while, but eventually I thought I could cope, so I went. And when I got there I felt really worried, and thought I would have to leave. But I found some strategies that worked, and I managed to self-regulate enough that I stayed until the end. I kept thinking I would have to leave (I point out that this is a thought, not a feeling) and that I wouldn’t be able to cope. But I did. It was exhausting so I engaged in a lot of self-care afterward. But next time I know I can do it. All day long we tell ourselves stories. Some of these are helpful and some of them are not. When you start telling yourself a story ask ‘is this helping me, or holding me back?’. If it is holding you back, acknoweldge that, name the story (ah, my ‘I can’t cope story!! I know that one) and move past it. Remember- you can always change your thoughts!! If you allow yourself a different perspective, you may actually find that you’re doing better than you realise. My mental health aim for the month of March is to catch my own stories and change the perspective. My crafty aim for the month of March is to dust off the camera and start finding a new perspective of the city I live in. The inlaws are around so I will be touristing anyway! 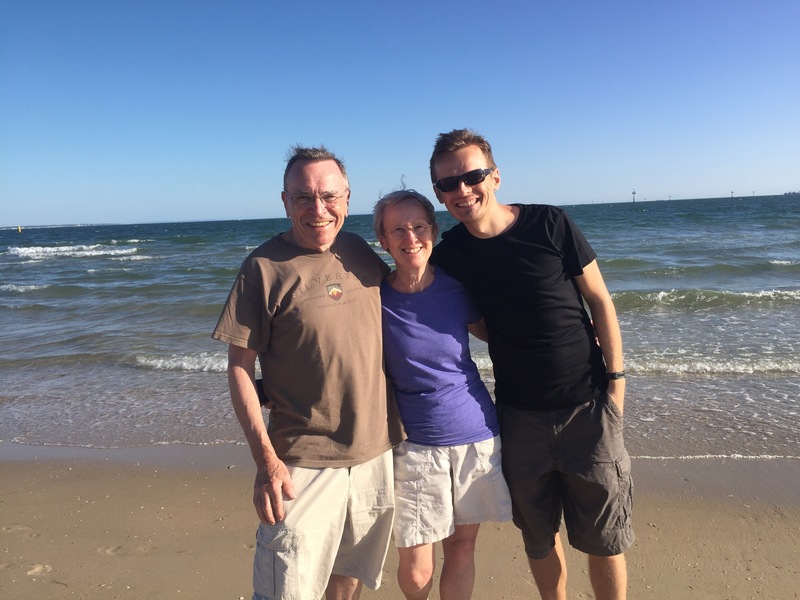 Stuart and his parents on the beach! A reason to be tourists for a day. Tourists in your own town, sounds good. Yes anxiety is an insidious thing and can get the better of us. Enjoy the different perspective.